Home » How Many Seeds to Plant Per Hole, Pot, or Cell? How Many Seeds to Plant Per Hole, Pot, or Cell? It’s a great question, Sally! 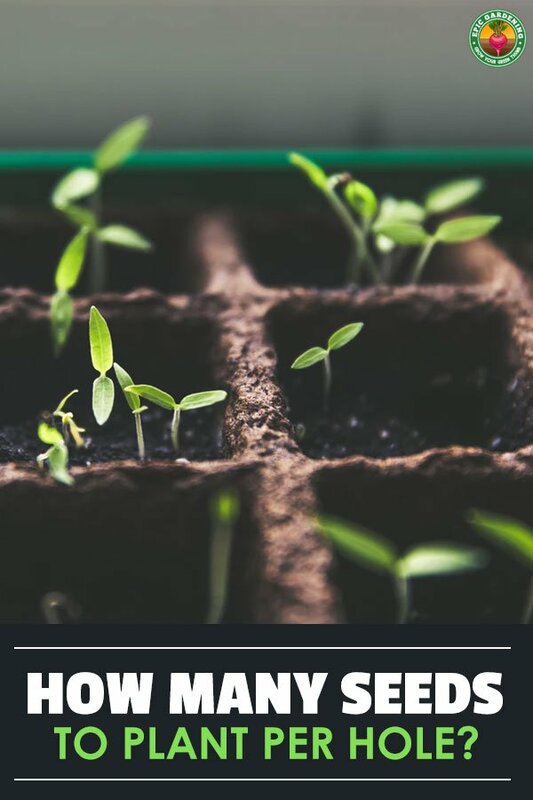 Understanding the answer to this question will improve your understanding of gardening and seed starting in general, because the answer hinges on an important concept: seed germination. Not all seeds are created equal. Some plant species have higher germination rates than others. Even within a single plant type, some of the seeds are older than others, causing the germination rate to go down. Imagine you’re growing arugula and the average germination rate is 90%. If you plant a 72 plant starter tray with one arugula seed per insert, you can expect only 65 of those plant inserts to actually germinate (72 x 90%). Now imagine you plant three arugula seeds per insert. Each of these seeds has a 10% chance of failing, so the probability of them all failing is 10% x 10% x 10% = 0.1%. This means that you are 99.9% likely to have the seeds in that cell germinate. So in a tray of 72 inserts, it would be extremely unlikely you would have any seeds not germinate — barring other factors that affect seed germination. In short: Planting more seeds per hole increases chance you have perfect germination rates. Just like not all seeds are created equal from a germination standpoint, not all seeds germinate equally. Sometimes you have a seed that shoots off like a rocket and becomes too leggy. If this was the only seed in your insert, you’d be forced to use it. By planting 2-3 seeds per cell, you allow yourself to luxury of choosing the seedlings that look the strongest. All you have to do is determine which one you like the most, then snip off the other seedlings to kill them. Like most things in gardening, there are always exceptions to this rule of 2-3 seeds per hole. If you’re planting large seeds like cucumbers, melons, or pumpkins, you should only use one seed per hole. However, you can still plant seeds close together and then thin them out once they’ve established themselves. You just want to avoid crowding these large seeds together so you don’t mess up the germination process. If you’re growing certain herbs (cilantro, dill, basil), you can get away with planting multiple seeds per hole and leaving them all there as they germinate. These plants can handle being planted right next to each other and basically become one larger, bushier plant. Now that you know how many seeds to plant per pot, you have a deeper understanding of seed germination in general. For more on seed starting, please check out the simple seed starting for hydroponics guide. This is probably a stupid question, but when the pack says 2 seeds per hole does that mean 2 individual seeds or 2 packs of seeds per hole? I do 2 beans per hole! I want to plant onions. How many seeds would I want per pellet?